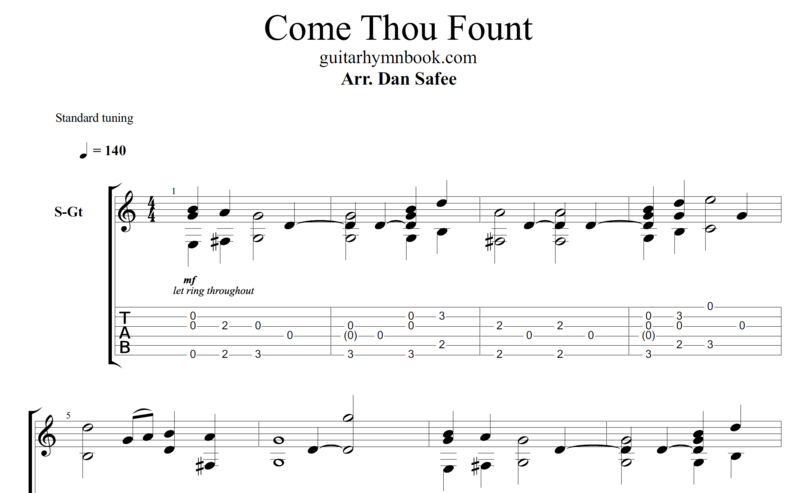 This was the first fingerstyle hymn I learned and is definitely a favorite to play. Every digital file on this site is instantly available for download after purchase via a link in your email. No waiting - just playing! For just $4.70 you are getting a high quality fingerstyle guitar tablature that includes both tab notation and regular musical notation. The file will be delivered by email in pdf format instantly after your purchase. You will need a pdf document viewer such as Adobe Acrobat or any number of other free viewers available on the web. You are free to print the tab as many times as you need and use it for any purpose so long as you don't redistribute it or sell it. If there's any question on what you want to use it for, just ask! You don't have to worry about any of the music or tablature posted on this site. Everything that is posted here is held to a biblical standard as outlined in my music philosophy. You can trust the stuff I put out! As a guitar player, one of my goals is to use my talent for the Lord. I've been playing guitar for over 6 years now and I have been always shocked at how little music is available for the musician that wants to honor Christ. That's why this website was started! With that said, this fingerstyle tab is a great way to improve your own skill and enjoy it by learning music that sounds good. It also would serve as an awesome offertory in your church! Buy now and get an instant digital PDF download!